A miniature Bronze Age Axe which dates to approximately 1000-800 BC was recovered by National Museum of Ireland and An Garda Síochána in Adare, Co Limerick after it was identified on a social media post. It is understood that the artefact was unearthed as a result of illegal metal detecting and it was not reported to the National Museum, as is required under legislation. However, Gardaí were successful in recovering it after it was reported by a member of the public, and a file is now subsequently being prepared for the Director for Public Prosecutions. The National Museum is appealing to members of the public to be vigilant about reporting discoveries of many archaeological objects. Director, Lynn Scarff said; “The moment artefacts of archaeological significance are taken from the ground they are under threat of deterioration and it’s also critical for our staff to study the ‘find spot’ because it can provide important evidence, both about the item and the area in which it was discovered. Therefore, it’s a matter of grave concern for us that the illegal use of metal detectors to search for archaeological objects continues and we want to appeal to members of the public to consider the greater public interest and the importance of these items to our national heritage, and to report any finds of note to us. “Thankfully this impressive axe-head was spotted on social media and a vigilant member of the public reported it appropriately. We would like to pay tribute to An Garda Síochána, and in particular Garda Patrick Buckley at Adare Garda Station and Superintendent John Deasy and members at Newcastle West Garda Station, for their work to secure its recovery. It’s a great example of active and responsible citizenship, working with the authorities to protect our shared heritage,” she said. 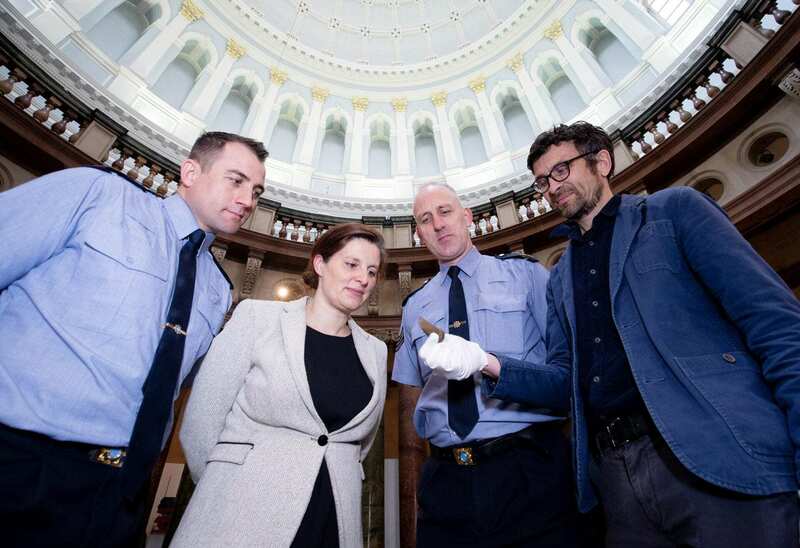 Header Image – Sergeant Andrew Lacey, Lynn Scarff, Director, National Museum of Ireland, Sergeant Gary Thompson and Matthew Seaver, Assistant Keeper, Irish Antiquities Division, National Museum of Ireland.